Ports North proposes to dredge over 5 million m³ of potentially contaminated mud to expand the Cairns shipping channel. This proposal is known at the Cairns Shipping Development Project. Dredging and dumping of dredge spoil poses many risks to the environment and to our fishing and tourism industries. 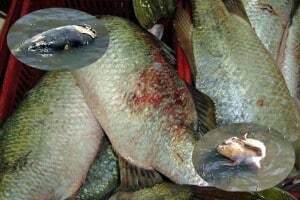 Dangers include smothering and cutting off light to seagrass beds and coral reefs, and stirring up toxins and acid sulphate soils which can lead to fish kills, disease and toxic mud washing up on our northern beaches. Read our Media Release regarding this article here. For more background and links to other detailed information on the proposal start here. 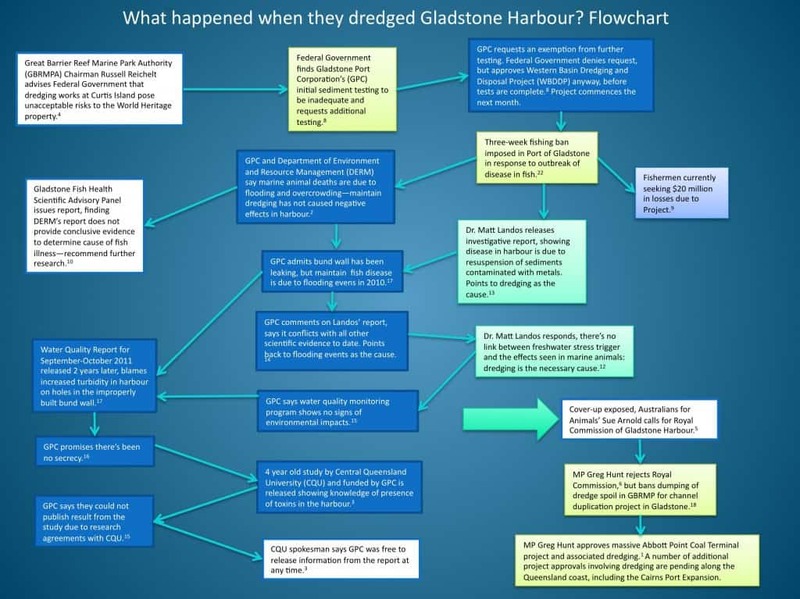 Flowchart – What happened when they dredged Gladstone Harbour? In 2011 the Gladstone Ports Corporation (GPC) commenced their Western Basin Dredging and Disposal Project (WBDDP) in the Port of Gladstone, Central Queensland. The approval of the project contributed to the decision by UNESCO’s World Heritage Committee to undertake the Reactive Monitoring Mission, a research project resulting in a call to review the Great Barrier Reef’s World Heritage status.1 The Great Barrier Reef may be put on the World Heritage Area “In Danger” list in June 2014, in part due to Gladstone and other approved or pending dredging proposals. Although GPC released comments refuting Dr. Landos’ research, he quickly dispelled their argument that flooding was the cause of disease, citing a larger flood, which occurred in January 2013 and had not produced similar effects in the harbour.7 and the fact that pathologies observed across the range of affected species could not be caused by freshwater. What are the dredging risks for Cairns? The Cairns Port Expansion project if approved would have a double impact. First would be the massive impact of the capital works dredging to deepen and widen the channel. Secondly the expanded channel would require a massive increase in the amount of maintenance dredging as currently occurs, an impact that would occur year after year and tip over the edge an environment already struggling to deal with a range of human impacts. Dredge spoil dumping increases water turbidity (muddiness), which smothers and cuts off light to corals and seagrasses. Our seagrass is in its worst state in recorded history and has not recovered from cyclone Yasi as it should have as revealed in our recent article Seagrass beds at record low – could the port expansion push them over the edge?. The recently released draft strategic assessment for the GBR has identified most of the reef as being in poor health and sediment and nutrient load as a major threat to reef health. Dredge spoil dumped in our region impacts on offshore reefs and would further muddy our Northern beaches. The mud to be dredged is almost certainly contaminated, and resuspending this sediment into the greater Trinity environment could lead to wildlife, and perhaps even human, health impacts. We only need to look at the outcomes of dredging in Gladstone harbour outlined above to understand the risks associated with this. A healthy marine environment is vital for our tourism and fishing industries and for community wellbeing. It’s not too late to withdraw the Cairns Shipping Development Project proposal and protect the beautiful marine environment we are so lucky to have on our doorstep. 7. Landos, D. M. (2013). Short Summary Response to Gladstone Ports Corporation scientist submission. Future Fisheries Veterinary Service, Aquatic Animal Health Chapter. Online: Gladstone Fishing Research Fund. 8. Moore, Tony. “Gladstone Harbour bund wall failures explained.” Brisbane Times. N.p., 20 Dec. 2013. Web. 6 Jan. 2014. <http://www.brisbanetimes.com.au/environment/gladstone-harbour-bund-wall-failures-explained-20131220-2zr0r.html>. Authors: Maya Knowles and Josh Coates. The authors would like to acknowledge the assistance of Dr Andrew Jeremijenko and Dr Matt Landos in reviewing this article.